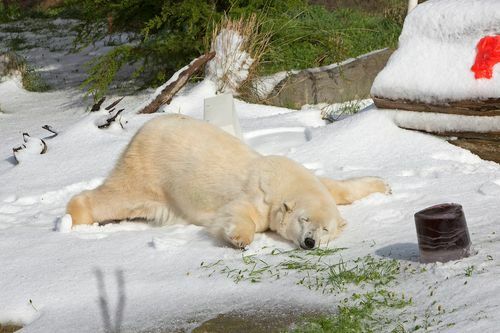 Polar bear called Pike gets 10 tons of snow as birthday gift. The photo below is for the polar bear called Pike (30). There is another bear called Ulu ( 32). Normally the polar bear life span is 15 years. The longevity of the bears shows that the upkeep at San Francisco zoo speaks volumes about the zoo keepers good work.The zoo’s commitment for the wellness of the animals is appreciable. The animal at zoo are treated like royals.Their meals are time are strictly followed. In case of any delay they start calling as evident from zoo keeper statements. Toys and enrichment are well taken care of.The animal are kept in captivity in a small area as it is expensive to have big sanctury with protection. The revnue of the zoo plus, donations are just about sufficient to break even So it is better to have smaller home than none at all. It seems cruel to not create something that would replicate bears natural habitat year round. In this case, it would be snow. He looks so happy that it just makes one wish he could have snow all year long.Their habitat normally doesn’t have snow year round. It’s So FLUFFY and cute.On the bright side, it doesn’t often rise above 55F where the zoo is, so a polar bear shouldn’t be too uncomfortable.